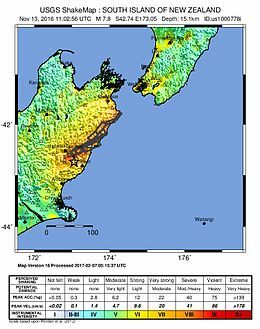 The 2016 Kaikoura earthquake was a magnitude 7.8 (Mw) earthquake in the South Island of New Zealand that occurred two minutes after midnight on 14 November 2016 NZDT (11:02 on 13 November UTC). Ruptures occurred on multiple faults and the earthquake has been described as the "most complex earthquake ever studied". The earthquake started at about 15 kilometres (9 mi) north-east of Culverden and 60 kilometres (37 mi) south-west of the tourist town of Kaikoura and at a depth of approximately 15 kilometres (9 mi). The complex sequence of ruptures lasted for about two minutes. The cumulative magnitude of the ruptures was 7.8, with the largest amount of that energy released far to the north of the epicentre. 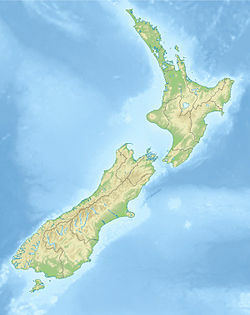 The large magnitude of the quake is second to only one New Zealand earthquake since European settlement of the country. Over $1.8 billion in insurance claims were received. There were two deaths, in Kaikoura and Mount Lyford. A complex sequence of ruptures with a combined magnitude of 7.8 started at 00:02:56 NZDT on 14 November 2016 and lasted approximately two minutes. The hypocentre (the point where the ruptures started) was at a depth of 15 kilometres (9 mi). The epicentre (the point on the Earth's surface above the hypocentre) was 15 kilometres (9 mi) north-east of Culverden and 95 km (59 mi) from Christchurch. From the hypocentre, ruptures ripped northwards at a speed of 2 km per second, over a distance of up to 200 km (124 mi). The largest amount of energy released did not occur at the epicentre, rather 100 km (62 mi) to the north near Seddon. Initial field surveys indicated ruptures on at least six faults, while more detailed studies confirmed ruptures on twenty-five faults. This is considered a world record for the greatest number of faults to rupture in a single earthquake event. The earthquake was assessed as the 'most complex earthquake ever studied' and prompted the reassessment of a number of assumptions about earthquake processes. There was motion on the Kekerengu Fault of up to 10 m (33 ft), movement on the Hundalee Fault, a newly identified fault in Waipapa Bay, as well as minor motion on the Seaward segment of the Hope Fault, and rupture on the Humps Fault and in the Emu Plains area. The offshore continuation of the Kekerengu Fault to the north east, known as the Needles Fault, ruptured as well. NIWA marine geologist Dr Philip Barnes said the length of the Kekerengu–Needles Fault rupture may extend for about 70 km (43 mi), consisting of 36 km (22 mi) on land and 34 km (21 mi) under the sea. Cape Campbell, at the north-eastern tip of the South Island, moved to the north-northeast by more than two metres – putting it that much closer to the North Island – and rose almost one metre. Kaikoura moved to the northeast by nearly one metre, and rose seventy centimetres. The east coast of the North Island moved west by up to five centimetres, and the Wellington region moved two to six centimetres to the north. Christchurch moved two centimetres to the south. The tsunami that followed the Kaikoura earthquake reached a peak height of about 7 metres. The tsunami was found to be highest at Goose Bay, with data indicating a maximum run-up height above tide level at the time of the tsunami of 6.9 m ± 0.3 m. At Oaro, the height was 5.3 m ± 0.3 m. Marine and freshwater flora and fauna were later found scattered across the Oaro River flood plain, extending 250 metres (820 ft) inland from the high tide mark on the day of the survey. Immediately after the earthquake, the tide level at the Kaikoura tide gauge started dropping. Over 25 minutes, it dropped about 2.5 m, a classic warning sign of a tsunami. During the next 15 minutes, the water level rose from its lowest level by about 4 m. That was followed by a series of waves over several hours. The water level at the Kaikoura gauge rose 2.5 m higher than it would have been. This was made up of a 1.5 m rise measured on the gauge, and a rise of about 1 m of the gauge itself, as the seabed and surrounding land rose by that amount. Some other tide gauges that recorded the tsunami were in Wellington Harbour, Castlepoint, Christchurch, and the Chatham Islands. A tsunami estimated at five metres high struck the north-facing Little Pigeon Bay on Banks Peninsula. The bay contained only one building, an unoccupied holiday house that was pushed off its foundations and heavily damaged. In neighbouring Pigeon Bay, the tsunami was observed at about 2 am but caused no damage. The Elms homestead, pictured here in 2012, collapsed during the earthquake, killing one person. Two people died in the earthquake. A man was crushed and died when the historic Elms Farm homestead near Kaikoura collapsed. Two other people were rescued from the rubble of the house, including the man's 100-year-old mother. A woman died in a log house that was damaged at Mount Lyford. Early reports said her cause of death was a heart attack, but an autopsy later indicated it was a head injury suffered during the earthquake. Many major roads were closed in the South Island because of slips and damage to bridges, including State Highway 1 between Picton and Waipara, and State Highway 7 between Waipara and Springs Junction (SH 65 turnoff). Most roads were cleared within 24 hours, but SH 1 between Seddon and Cheviot via Kaikoura and the Inland Kaikoura Road remained closed. The closure of SH1, the Inland Kaikoura Road and the Main North Line railway effectively cut off all land routes into Kaikoura. As of the morning of 19 November, Kaikoura remained cut off by road due to landslides, damaged bridges and infrastructure, road subsidence, and the risk of falling debris. The NZ Transport Agency said that State Highway 1 would take months to repair, while repairs to the rail line, a key freight connection between Wellington and Christchurch, were likely to take more than a year. Parts of the diversion route via State Highways 63, 6, 65 and 7 were experiencing four times their usual traffic volume. Mains water supply was mostly restored to Kaikoura township by 19 November, but supply was in a "fragile state" and conservation was necessary. The sewage system was "severely damaged" and unusable. On 30 November 2016, the Inland Kaikoura Road, redesignated "Kaikoura Emergency Access Road", was reopened to civilian drivers holding a permit and for restricted times of the day. Twenty-five crews had worked to clear 50 landslips on that highway alone. It reopened unrestricted to all traffic on 19 December 2016. State Highway 1 south of Kaikoura reopened two days later on 21 December 2016, albeit only during daylight hours. Repair of the highway north of Kaikoura took substantially longer, with the repaired highway opening over a year later on 15 December 2017. The long term closure of State Highway 1 north of Kaikoura (between Mangamaunu and Clarence) resulted in a detour through the Lewis Pass being the only major route from Picton to Christchurch. This highway had to be upgraded significantly due to this increased usage. The section of the Main North Line rail link from Picton south to Lake Grassmere reopened on 16 January 2017. The complete railway from Picton to Christchurch was not restored until 15 September 2017, though service was limited thereafter by continued landslides and repair work; passenger service did not resume until 1 December 2018. In the city of Wellington, buildings were damaged, several beyond repair. Damage to docks briefly halted ferry traffic across Cook Strait; more significantly, container shipping did not resume for over ten months. The Wellington City Council was given special powers to require reports from building owners, and there were doubts about application of the rules. Several buildings were closed temporarily because of doubts about stairwells. In Lower Hutt, a cinema complex and part of the carpark in the Queensgate Shopping Centre was deemed unsafe and was demolished. At Ava railway station, one of the pedestrian access ramps was damaged and was removed during the weekend of 17 and 18 December, leaving the station without wheelchair access until such time as the ramp can be replaced. A 54-year-old nine-storey office block at 61 Molesworth Street was demolished during December 2016, after fears that it could collapse. The Reading Cinema parking building off Courtenay Place was also damaged and was demolished during January 2017. Both building failures resulted in a section of the adjacent street (Molesworth Street and Tory Street) being closed off for a period. By February 2017, business insurance claims had passed NZ$900 million. The Wellington region had two thirds (65%) of the total losses, followed by the upper South Island at 25%, Canterbury at 8% and the remaining 2% from other North Island claims. Several houses in the coastal suburb of New Brighton in Christchurch were looted after the occupants left because of tsunami risk. Schools and universities across the region were told to remain closed until the situation could be assessed, affecting the end-of-year NCEA examinations for secondary school students. Exams on the day of the earthquake were cancelled in many schools, including all of Wellington. Students received derived grades for any exams due to be taken the week of the earthquake. Prime Minister John Key surveyed the damage from the air and later described the scenes as "utter devastation" and estimated that reconstruction would take months and cost billions of dollars. The New Zealand Defence Force dispatched five Royal New Zealand Air Force helicopters (four NH90s and one Agusta A109), a P-3 Orion and a C-130 Hercules to survey and provide essential emergency supplies to the most-severely affected areas around Kaikoura. Kaikoura Aerodrome was too small to take larger multi-engine aircraft so landing was limited to helicopters and small aircraft. The Royal New Zealand Navy's multi-role vessel HMNZS Canterbury and off-shore patrol vessel HMNZS Wellington were deployed to Kaikoura to provide aid supplies and evacuate people. HMCS Vancouver, HMAS Darwin and USS Sampson, in New Zealand waters for the RNZN's 75th birthday celebrations in Auckland, were redirected by their respective governments to assist. A United States Navy P-3 Orion of VP-47 and two Kawasaki P-1s of the Japan Maritime Self-Defense Force's Air Patrol Squadron 3, also visiting RNZAF Base Whenuapai for the RNZN 75th anniversary events, were deployed to assist. The New Zealand Defence Force also deployed HMNZS Te Kaha and HMNZS Endeavour to support the operation. The New Zealand Fire Service dispatched urban search and rescue teams to Wellington and Kaikoura. Paramedics were also dispatched from St John. Nearly 200 people had been airlifted out of Kaikoura by late evening on 15 November, with about 1,000 still to be evacuated on the following morning. Stranded tourists with health issues and travel plans were put on a flight priority list. HMNZS Canterbury arrived in Kaikoura on 16 November and transported about 450 evacuees, 4 dogs, and 7 tonnes of luggage to Lyttelton, arriving early the following morning. On the morning of 20 November, HMNZS Canterbury arrived at Lyttelton with another group of evacuees, bringing the total number evacuated from Kaikoura to more than 900. Merrifield, ALR (Rob) (2018). The Kaikoura Job: Rebuilding KiwiRail's Main North Line. Wellington: NZ Railway & Locomotive Society. ISBN 978-0-908573-96-7. Pennington, Phil (2017). Surviving 7.8: New Zealanders respond to the earthquakes of November 2016. Auckland: HarperCollins. ISBN 978-1-7755-4110-3. ^ a b c "M7.8 – 53km NNE of Amberley, New Zealand". United States Geological Survey. 13 November 2016. Retrieved 19 November 2016. ^ a b c "Magnitude 7.8, Mon, Nov 14 2016, 12:02:56 am (NZDT)". GeoNet. Retrieved 16 November 2016. ^ "A year on, how is the Kaikōura aftershock sequence playing out compared to Darfield?". GeoNet. Retrieved 29 November 2017. ^ a b c d "Earthquake: Deaths, major damage after severe 7.5 quake hits Hanmer Springs, tsunami warning issued". Stuff. 14 November 2016. Retrieved 7 May 2017. ^ "As it happened: A second day of aftershocks as evacuations began in earthquake-hit Kaikoura". TVNZ. 14 November 2016. ^ a b Amos, Jonathan (23 March 2017). "Kaikoura: 'Most complex quake ever studied'". BBC. Retrieved 26 March 2017. ^ "Tsunami hits N. Zealand after powerful earthquake, aftershocks". RT. Retrieved 13 November 2016. ^ "Region by region: severe quake hits". Stuff. Retrieved 13 November 2016. ^ Taylor, Matthew (13 November 2016). "Tsunami hits New Zealand east coast after 7.5-magnitude earthquake". The Guardian. Retrieved 13 November 2016. ^ a b "Watching the M7.8 Kaikoura quake dominos fall in real time". GeoNet. Retrieved 10 December 2016. ^ "Kaikoura earthquake update: Magnitude revised". GeoNet. 16 November 2016. Retrieved 16 November 2016. ^ Morton, Jamie (16 November 2016). "7.8 earthquake: How does it compare?". New Zealand Herald. ^ "Insurance claims total $1.84 billion for Kaikoura earthquake". ^ a b Kitching, Chris; Walker, Marc; Elvey, Suz (13 November 2016). "New Zealand tsunami: Live updates as families warned to flee coast 'immediately' after 7.8-magnitude earthquake". Daily Mirror. Retrieved 13 November 2016. ^ "New Zealand earthquake: Tsunami arrives after powerful tremor hits". BBC. 13 November 2016. Retrieved 13 November 2016. ^ a b c Morton, Jamie (21 November 2016). "The Big Read: Unravelling the quirks of the Kaikoura Earthquakes". New Zealand Herald. ^ a b Manhire, Toby (16 November 2016). "This stunning map shows that six faults – at least six – ruptured in the big Kaikoura quake". The Spinoff. Retrieved 22 November 2016. ^ "Kaikōura two years on: The changed landscape". GeoNet. GNS Science. 12 November 2018. Retrieved 14 November 2018. ^ "M7.8 Kaikoura Earthquake: Latest updates". GeoNet. Retrieved 10 December 2016. ^ "Huge fault rupture stretches 34km offshore from Kaikoura". Stuff.co.nz. 23 November 2016. Retrieved 24 November 2016. ^ a b Daly, Michael (29 March 2017). "November tsunami up to 7 metres high". The Press. p. A4. Retrieved 28 March 2017. ^ a b McDonald, Liz (14 November 2016). "Little Pigeon Bay cottage smashed by tsunami waves". Stuff. Retrieved 16 November 2016. ^ "More info on the impact of Monday's tsunami". GeoNet. 18 November 2016. Retrieved 22 November 2016. ^ "Tragic rescue: 100-year-old pulled from rubble after son killed in devastating quake". The New Zealand Herald. 14 November 2016. ^ Howie, Cherie (6 May 2017). "'It was just a freak thing' - Partner of Kaikoura earthquake victim". The New Zealand Herald. Retrieved 7 May 2017. ^ "Alternative route between Christchurch and Picton established". Stuff.co.nz. 14 November 2016. Retrieved 14 November 2016. ^ "North Canterbury 7.5 quake: Roads damaged and blocked, public transport disrupted". Stuff. 14 November 2016. Retrieved 14 November 2016. ^ "Insane photos show bitumen uprooted from quake-ravaged Kaikoura road". Television New Zealand. 14 November 2016. Retrieved 14 November 2016. ^ "Quake-hit road to Kaikoura staying closed, says Civil Defence". NZ Herald. 19 November 2016. Retrieved 19 November 2016. ^ "Rail near Kaikoura likely out for a year, 'unprecedented' damage to highway". Stuff.co.nz. 19 November 2016. Retrieved 19 November 2016. ^ Staff reporters (19 November 2016). "Traffic on SH7 expected to quadruple while SH1 is repaired". Stuff.co.nz. Retrieved 19 November 2016. ^ a b "Quake updates: Evacuees arrive in Christchurch". NZ Herald. 20 November 2016. Retrieved 20 November 2016. ^ "Kaikoura earthquake: emergency access road set to open with restrictions". NZ Herald. 30 November 2016. Retrieved 30 November 2016. ^ Nicholas. Jones@Nzherald. Co. Nz @Nickjonesnzer, Nicholas Jones Political Reporter (21 December 2016). "Relief from residents as road south of Kaikoura reopened by Simon Bridges". NZ Herald. Retrieved 23 December 2016. ^ "Kaikoura Earthquake Response". NZ Transport Agency. Retrieved 12 August 2018. ^ "Travel information for Canterbury and Marlborough regions". NZTA. Retrieved 4 April 2017. ^ "The NZ Transport Agency says a substantial programme of safety and strengthening work is ramping up along the alternate state highway route from Picton to Christchurch, via the Lewis Pass". NZTA. 13 December 2016. Retrieved 4 April 2017. ^ "First train south to Lake Grassmere a 'milestone' for Main North Line repairs". Stuff.co.nz. 16 January 2017. Retrieved 16 June 2017. ^ Merrifield 2018, pp. 86-91. ^ Williams, David (17 November 2017). "KiwiRail's secret hopes for Kaikoura line repairs". Newsroom. ^ "Kaikoura earthquake rips through New Zealand". The Great Journeys of New Zealand. 19 July 2018. ^ Wilson, Antonia (30 November 2018). "New Zealand's Coastal Pacific railway back on track after Kaikoura earthquake". TheGuardian.com. Retrieved 3 December 2018. ^ "Earthquake buildings in Wellington". Stuff (Fairfax). 27 December 2011. ^ "Maersk to return to Wellington when CentrePort's cranes are repaired". Stuff (Fairfax Media). 1 August 2017. ^ "Wellington building owners on notice to get earthquake inspections done". Stuff (Fairfax Media). 7 April 2017. ^ "New earthquake laws could force building owners to strengthen within a year". Stuff (Fairfax Media). 25 January 2017. ^ "Confusion and lack of clarity around assessing quakedamaged buildings". Stuff (Fairfax Media). 8 December 2016. ^ "Stairwell problem could keep NZ Post-House closed until Christmas". Stuff (Fairfax Media). 24 November 2016. ^ "IRD Wellington headquarters evacuated over suspected quakestruck stairwell". Stuff (Fairfax Media). 24 November 2016. ^ Devlin, Collette; Williams, Katarina (25 November 2016). "Carpark building and cinema at Queensgate Mall in Lower Hutt will be demolished". Stuff.co.nz. Retrieved 25 November 2015. ^ Wenman, Eleanor (13 December 2016). "Ava Station loses pedestrian ramp access". Stuff (Fairfax Media). Retrieved 5 February 2017. ^ "Molesworth Street artwork can be saved". Emergency Management. Wellington City Council. 19 January 2017. Retrieved 23 January 2017. ^ "The birth and death of ICI: 61 Molesworth". Eye of the Fish. 16 December 2016. Retrieved 23 January 2017. ^ "Demolition starts on Reading carpark". Emergency Management. Wellington City Council. 4 January 2017. Retrieved 23 January 2016. ^ Insurance Council of New Zealand (1 February 2017). "Kaikoura earthquake business claims reach $900 million". Scoop Business. Retrieved 7 March 2017. ^ "Quake-damaged block of Malvina Major retirement village to be demolished". Stuff (Fairfax Media). 23 November 2016. ^ "Defence House in Wellington to be demolished after investigations show repairs to earthquake damage uneconomic". The New Zealand Herald. 3 March 2017. ^ "Freyberg House to be demolished". Stuff (Fairfax). 3 March 2017. ^ "Unacceptable performance of building says Minister". Stuff (Fairfax). 26 July 2017. ^ "Demolition begins on Stats House". Stuff (Fairfax). 28 December 2017. ^ "Dozens of buildings still unsafe". Stuff (Fairfax). 21 December 2017. ^ "Three hundred buildings require strengthening within a year". Stuff (Fairfax). 25 January 2017. ^ "Eighty buildings require strengthening within a year". Stuff (Fairfax). 20 December 2016. ^ "Call for Stats House floor hangers to be banned". Stuff (Fairfax). 10 October 2017. ^ "Steel stretched in Wellington high-rise on Customhouse Quay". Stuff (Fairfax). 28 May 2017. ^ "Deadly earthquake: Looters ransack evacuated home in tsunami zone". The New Zealand Herald. 13 November 2016. Retrieved 13 November 2016. ^ "Generosity of strangers wins out for Christchurch family burgled after quake". Stuff.co.nz. 14 November 2016. Retrieved 13 November 2017. ^ a b "Live: 7.5 magnitude earthquake strikes near Hanmer Springs in South Island, tsunami warning for many New Zealand coastal areas". The New Zealand Herald. 13 November 2016. Retrieved 13 November 2016. ^ "Earthquake: Schools, universities closed, exams disrupted". Stuff.co.nz. Retrieved 14 November 2016. ^ Jones, Nicholas (14 November 2016). "Unfair to make many students sit NCEA exams today – John Key". The New Zealand Herald. Retrieved 14 November 2016. ^ Bradford, Katie (14 November 2016). "'Billions' needed to repair Kaikoura roads after 7.5 earthquake, says PM". Tvnz. Television New Zealand. Retrieved 14 November 2016. ^ "HMNZS Canterbury sent to Kaikoura". The New Zealand Herald. 14 November 2016. Retrieved 14 November 2016. ^ "Fleet of international warships to help out with earthquake response". New Zealand Herald. 15 November 2016. ISSN 1170-0777. Retrieved 15 November 2016. ^ "International Naval Review: RNZN 75th Anniversary". 18 November 2016. Retrieved 20 November 2016. ^ "Earthquake: International flotilla and aircraft drafted in to help with humanitarian relief in Kaikoura". Stuff.co.nz. 15 November 2016. Retrieved 17 November 2016. ^ "Last communal meal at Takahanga Marae in Kaikoura tomorrow as some earthquake relief efforts wound up". NZ Herald. 20 November 2016. Retrieved 10 March 2017. ^ "About 600 evacuated from Kaikoura as third day after quake closes". Tvnz. TVNZ – tvnz.co.nz. 16 November 2016. Retrieved 10 March 2017. ^ "NZ quake: Nearly 200 people airlifted from Kaikoura as evacuations continue". Yahoo! New Zealand. 16 November 2016. Retrieved 16 November 2016. ^ "Kaikoura evacuation: Sickness and travel plans determine who goes first". NZ Herald. 15 November 2016. Retrieved 16 November 2016. ^ "Quake evacuees from Kaikoura arrive in Christchurch on HMNZS Canterbury". Stuff.co.nz. 17 November 2016. Retrieved 17 November 2016. ^ "M 7.8 Kaikōura Mon, Nov 14 2016". geonet.org.nz. Retrieved 22 October 2017. ^ "Magnitude 5.9, Mon, Nov 14 2016, 12:19:32 am (NZDT)". geonet.org.nz. Retrieved 13 November 2016. ^ "Magnitude 5.6, Mon, Nov 14 2016, 12:24:17 am (NZDT)". geonet.org.nz. Retrieved 13 November 2016. ^ "Magnitude 5.0, Mon, Nov 14 2016, 12:30:25 am (NZDT)". geonet.org.nz. Retrieved 13 November 2016. ^ "Magnitude 6.2, Mon, Nov 14 2016, 12:32:06 am (NZDT)". geonet.org.nz. Retrieved 13 November 2016. ^ "Magnitude 5.5, Mon, Nov 14 2016, 12:33:49 am (NZDT)". geonet.org.nz. Retrieved 13 November 2016. ^ "Magnitude 5.6, Mon, Nov 14 2016, 12:41:48 am (NZDT)". geonet.org.nz. Retrieved 13 November 2016. ^ "Magnitude 6.2, Mon, Nov 14 2016, 12:52:44 am (NZDT)". geonet.org.nz. Retrieved 13 November 2016. ^ "Magnitude 5.2, Mon, Nov 14 2016, 1:03:53 am (NZDT)". geonet.org.nz. Retrieved 13 November 2016. ^ "Magnitude 5.3, Mon, Nov 14 2016, 1:04:21 am (NZDT)". geonet.org.nz. Retrieved 13 November 2016. ^ "Magnitude 5.0, Mon, Nov 14 2016, 1:20:41 am (NZDT)". geonet.org.nz. Retrieved 13 November 2016. ^ "Magnitude 5.2, Mon, Nov 14 2016, 1:25:55 am (NZDT)". geonet.org.nz. Retrieved 13 November 2016. ^ "Magnitude 5.2, Mon, Nov 14 2016, 1:27:59 am (NZDT)". geonet.org.nz. Retrieved 13 November 2016. ^ "Magnitude 5.2, Mon, Nov 14 2016, 1:37:43 am (NZDT)". geonet.org.nz. Retrieved 13 November 2016. ^ "Magnitude 5.3, Mon, Nov 14 2016, 1:38:38 am (NZDT)". geonet.org.nz. Retrieved 13 November 2016. ^ "Magnitude 5.1, Mon, Nov 14 2016, 1:52:18 am (NZDT)". geonet.org.nz. Retrieved 13 November 2016. ^ "Magnitude 5.7, Mon, Nov 14 2016, 2:21:11 am (NZDT)". geonet.org.nz. Retrieved 13 November 2016. ^ "Magnitude 6.0, Mon, Nov 14 2016, 2:31:26 am (NZDT)". geonet.org.nz. Retrieved 13 November 2016. ^ "Magnitude 5.1, Mon, Nov 14 2016, 2:50:01 am (NZDT)". geonet.org.nz. Retrieved 13 November 2016. ^ "Magnitude 5.1, Mon, Nov 14 2016, 3:04:04 am (NZDT)". geonet.org.nz. Retrieved 13 November 2016. ^ "Magnitude 5.3, Mon, Nov 14 2016, 4:33:03 am (NZDT)". geonet.org.nz. Retrieved 13 November 2016. ^ "Magnitude 5.1, Mon, Nov 14 2016, 6:17:39 am (NZDT)". geonet.org.nz. Retrieved 13 November 2016. ^ "Magnitude 5.2, Mon, Nov 14 2016, 7:34:26 am (NZDT)". geonet.org.nz. Retrieved 13 November 2016. ^ "Magnitude 5.4, Mon, Nov 14 2016, 7:58:45 am (NZDT)". geonet.org.nz. Retrieved 13 November 2016. ^ "Magnitude 5.2, Mon, Nov 14 2016, 7:59:10 am (NZDT)". geonet.org.nz. Retrieved 13 November 2016. ^ "Magnitude 5.0, Mon, Nov 14 2016, 8:09:14 am (NZDT)". geonet.org.nz. Retrieved 13 November 2016. ^ "Magnitude 5.1, Mon, Nov 14 2016, 8:28:44 am (NZDT)". geonet.org.nz. Retrieved 13 November 2016. ^ "Magnitude 5.0, Mon, Nov 14 2016, 9:21:27 am (NZDT)". geonet.org.nz. Retrieved 13 November 2016. ^ "Magnitude 5.0, Mon, Nov 14 2016, 9:22:14 am (NZDT)". geonet.org.nz. Retrieved 13 November 2016. ^ "Magnitude 5.1, Mon, Nov 14 2016, 9:51:21 am (NZDT)". geonet.org.nz. Retrieved 14 November 2016. ^ "Magnitude 5.4, Mon, Nov 14 2016, 11:19:32 am (NZDT)". geonet.org.nz. Retrieved 14 November 2016. ^ "Magnitude 5.2, Mon, Nov 14 2016, 12:17:32 pm (NZDT)". geonet.org.nz. Retrieved 14 November 2016. ^ "Magnitude 5.2, Mon, Nov 14 2016, 12:49:11 pm (NZDT)". geonet.org.nz. Retrieved 14 November 2016. ^ "Magnitude 5.0, Mon, Nov 14 2016, 12:54:43 pm (NZDT)". geonet.org.nz. Retrieved 14 November 2016. ^ "Magnitude 5.7, Mon, Nov 14 2016, 1:33:51 pm (NZDT)". geonet.org.nz. Retrieved 14 November 2016. ^ "Magnitude 6.3, Mon, Nov 14 2016, 1:34:22 pm (NZDT)". geonet.org.nz. Retrieved 14 November 2016. ^ "Magnitude 5.3, Mon, Nov 14 2016, 2:28:22 pm (NZDT)". geonet.org.nz. Retrieved 14 November 2016. ^ "Magnitude 5.3, Mon, Nov 14 2016, 2:30:14 pm (NZDT)". geonet.org.nz. Retrieved 14 November 2016. ^ "Magnitude 5.0, Mon, Nov 14 2016, 6:16:31 pm (NZDT)". geonet.org.nz. Retrieved 14 November 2016. ^ "Magnitude 5.6, Mon, Nov 14 2016, 7:43:00 pm (NZDT)". geonet.org.nz. Retrieved 14 November 2016. ^ "Magnitude 5.7, Mon, Nov 14 2016, 7:47:52 pm (NZDT)". geonet.org.nz. Retrieved 14 November 2016. ^ "Magnitude 5.8, Mon, Nov 14 2016, 8:21:04 pm (NZDT)". geonet.org.nz. Retrieved 14 November 2016. ^ "Magnitude 5.0, Mon, Nov 14 2016, 10:49:56 pm (NZDT)". geonet.org.nz. Retrieved 15 November 2016. ^ "Magnitude 5.1, Tue, Nov 15 2016, 12:16:42 am (NZDT)". geonet.org.nz. Retrieved 15 November 2016. ^ "Magnitude 5.0, Tue, Nov 15 2016, 8:17:33 am (NZDT)". geonet.org.nz. Retrieved 15 November 2016. ^ "Magnitude 5.8, Tue, Nov 15 2016, 2:34:45 pm (NZDT)". geonet.org.nz. Retrieved 15 November 2016. ^ "Magnitude 5.2, Tue, Nov 15 2016, 2:43:52 pm (NZDT)". geonet.org.nz. Retrieved 15 November 2016. ^ "Magnitude 5.4, Tue, Nov 15 2016, 6:09:27 pm (NZDT)". geonet.org.nz. Retrieved 15 November 2016. ^ "Magnitude 5.8, Tue, Nov 15 2016, 7:30:33 pm (NZDT)". geonet.org.nz. Retrieved 15 November 2016. ^ "Magnitude 5.0, Thu, Nov 17 2016, 10:05:00 am (NZDT)". geonet.org.nz. Retrieved 17 November 2016. ^ "Magnitude 5.0, Sat, Nov 19 2016, 3:22:58 am (NZDT)". geonet.org.nz. Retrieved 18 November 2016. ^ "Magnitude 5.0, Sun, Nov 20 2016, 7:52:48 pm (NZDT)". geonet.org.nz. Retrieved 20 November 2016. ^ "Magnitude 5.7, Tue, Nov 22 2016, 6:13:34 pm (NZDT)". geonet.org.nz. Retrieved 22 November 2016. ^ "Magnitude 5.5, Sun, Dec 4 2016, 4:15:47 pm (NZDT)". geonet.org.nz. Retrieved 4 December 2016. ^ "Magnitude 5.5, Thu, Dec 29 2016, 3:34:33 pm (NZDT)". geonet.org.nz. Retrieved 29 December 2016. ^ "Magnitude 5.3, Fri, Jan 6 2017, 12:17:33 am (NZDT)". geonet.org.nz. Retrieved 6 January 2017. ^ "Magnitude 5.1, Wed, Jan 11 2017, 1:19:22 pm (NZDT)". geonet.org.nz. Retrieved 11 January 2017. ^ "Magnitude 5.3, Wed, Feb 1 2017, 11:21:29 pm (NZDT)". geonet.org.nz. Retrieved 1 February 2017. ^ "Magnitude 5.2, Sun, Feb 12 2017, 9:18:54 am (NZDT)". geonet.org.nz. Retrieved 12 February 2017. ^ "Magnitude 5.2, Thu, Mar 2 2017, 8:01:02 am (NZDT)". geonet.org.nz. Retrieved 2 March 2017. ^ "Magnitude 5.1, Wed Sep 20 2017 2:42 PM". geonet.org.nz. Retrieved 22 October 2017. ^ "Magnitude 5.4, Sun Oct 22 2017 5:10 PM". geonet.org.nz. Retrieved 22 October 2017. This page was last edited on 4 April 2019, at 01:07 (UTC).